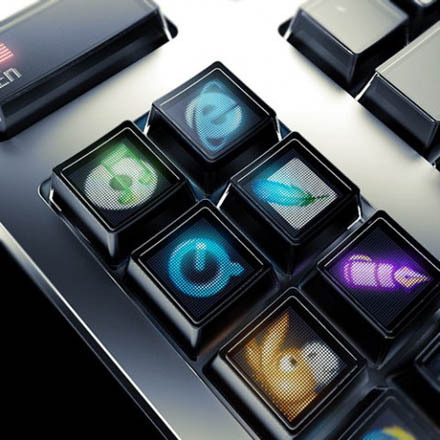 Vaporware Afficcionados, Meet The Optimus Keyboard. Again. Without The Color | OhGizmo! We’re not going to kid anyone. We like to toot our own horns at OhGizmo HQ. So, we’re going to point out a few things, just for the record. Not many people know this, but we here at OhGizmo got the ball rolling for the long awaited, soon-to-be vaporware awardee, uber-OLEDkeyboard of The Gods: The Optimus. After we posted about it, here, it got picked up by Gizmodo, the news exploded and then the rest is history. We always felt as if that would at least earn us a review unit, but alas it never came. Nor, mind you, do we think it ever could. See, just a few months ago, I called BS on the device (here) because not only had the unit been postponed several times, the company was releasing the Mini Three: a three-key version of the full size keyboard. We thought it pretty pointless, and a sign that ArtLebedev Studios were full of it. Well, today we have even more confirmation that we’re all just being taken on a “send-us-your-preorder-money” ride, and we might just have been right back then. It seems that the first production run of the keyboard will feature monochrome keys! And, the full color version will allegedly come later, “for a greater price…” Please. You got nothing. You got a bunch of attention a while ago, out of the blue, and instead of fessing up and telling us you had nothing, you tried to pull a fast one on us. Maybe you have been too hasty with your accusations. Despite the delays, the Lebedev people seem to be making progress. Or you know, you could just write gconf scripts to open programs in Ubuntu. They keyboard is actually for sale now, its $1,564.37. what company has a livejournal instead of an actual website?